For many students, this will be their first time living away from home. They’re used to the large spaces they had while growing up so they may not expect the limits that come with their new accommodations. Show future residents that they can still live large even in a smaller space. Here’s what you can do to help them keep clutter at bay. When someone evaluates a property, they also think about how they can make it feel like home. That means you need to leave room for some personalization. Even if a place is fully-furnished, the resident may still want to bring in some of their own stuff. For smaller spaces, will there be enough room for those additions? Unfurnished rooms can be an option but not everyone wants to buy new furniture, especially students. Using multipurpose furniture is a good middle ground. For example, an ottoman that can double as a coffee table or an end table that’s designed to be also used as a stool. 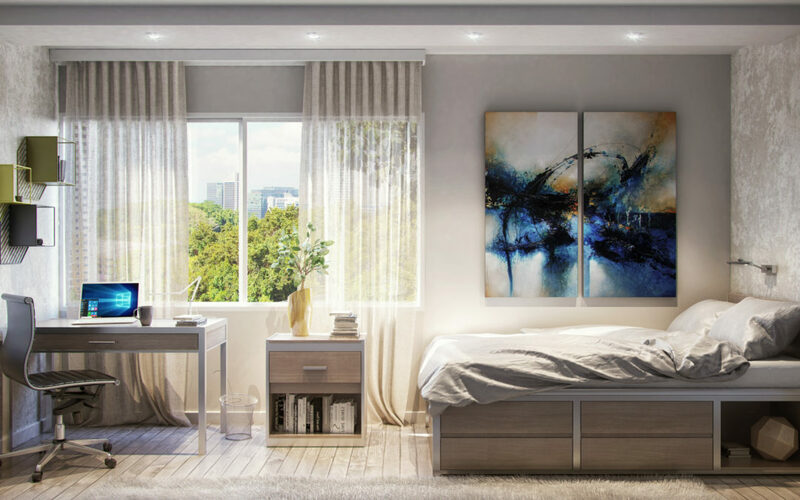 New residents can move in without worrying about bringing in essential furniture while those who want to add their own can do so without worrying about running out of space. Do you know why bunk beds are a staple in student housing? One of the reasons is that they make efficient use the space they occupy. And they do that by going up. When you want to make room for more, don’t forget to consider vertical space. Instead of taking up more of the already limited floor area, multi-level shelving and overhead storage ensure that there’s always a place to keep belongings. Take it a step further with wall-mounted hooks for coats and bags, and floating shelves. Because they don’t touch the floor, it creates a look that’s clean and spacious but also practical – exactly the qualities many residents are looking for. The most common reason for clutter is not having a place to hide stuff. In this case, furniture with built-in storage is a great way to maximize the space that would otherwise be unused. One example would be a bed with nooks and drawers built into the frame. For a living room, you can use a sofa that has a storage space hidden below the cushions. Nightstands and end tables that have shelves or small cabinets underneath also work. As a bonus, creative storage solutions like these appeal to people who are looking for something unique. Give tenants the tools they need to keep their rooms clutter-free. Whether you just need pieces with hidden storage or custom interior designs, Dickson Furniture Manufacturers can help you make the most of any space.